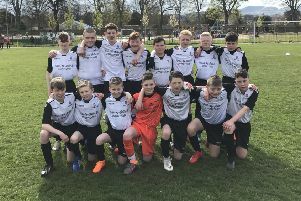 The final of the Edinburgh Cup awaits Longniddry Villa 13s after they beat Lasswade Thistle Reds 2-1 in the last four. A goal in each half, by Josh Laidlaw and Lewis Lang, put them on their way before a Gregor Robinson wonder goal set up a tense finish. Longniddry started well as they attempted to press home their home advantage and won a penalty after three minutes. However, Lang was unfortunate to see his effort go just wide. Harry Clark had a shot from just inside the box well-saved by Dylan Gibson, but Longniddry made the breakthrough on 25 minutes. After Clark had tried to force his way through a crowded box, Laidlaw pounced on the loose ball, his shot appearing to take a slight deflection before sailing into the top corner. Jamie Bannerman almost forced home an equaliser at the back post but a defender got in the way. The search for a leveller continued after the break and Bannerman raced clear of the defence, only to find Ben Taylor in the way. From the corner, Taylor made another save from Lewis Neill, tipping the defender’s shot onto the post. Soon after that double chance, Lasswade were punished when Lang was sharp to react and knocked in the rebound after Saul McRitchie’s low drive was parried. Villa worked hard to preserve their lead, although a terrific cross from Shaun Brady found Kieran McCorquodale at the back post, but Taylor was brave again. In the very last minute, Robinson pulled one back when he ran on to a clearance and let fly from 30 yards to score an absolute screamer. But it wasn’t enough to stop Longniddry booking a final date with Edinburgh South, who beat Arniston Rangers in the other tie. Tynecastle 14s beat St Bernards BC Midlothian 4-2 to make it to the semi-finals of the John Crawford Memorial Trophy. Sam Nicholson netted twice for Tynecastle with Alfie Robinson and Corin Brown getting one apiece. An eventful Division Two match between Edinburgh City Reds and Edinburgh South 16s swung this way and that before ending 4-3 to the Reds. South had taken an early lead through Tom Gill but a Josh Moran double made it 2-1 to the home side, before Aodhan Heaney levelled it up at the halfway stage. City pressed their opponents after the break and Ryan Ironside won and converted a penalty to regain the lead. Both sides continued to create but it was City who earned some breathing space thanks to Moran, who cut in from the left for his hat-trick. A missed penalty meant South blew their chance to eat back into the deficit but Ben Carrigan did manage to force the ball over the line to make it 4-3. Their cause was helped when their opponents were reduced to ten men, but Reds managed to hold on. Dalkeith Thistle Blacks 19s knocked Musselburgh Windsor Blues out of the David Murray Cup at the quarter-final stage, with new signing Scott Hay giving them a 2-1 win with two headed goals. Both came from set plays – the first a Ronan Clelland free-kick and then a Thomas Wishart corner. Dalkeith must wait for two rounds of fixtures before finding out who they will play in the semi-finals from Leith Athletic, Edinburgh United or Cramond.